Rudolph Diesel was born in Paris of Bavarian parents in 1858. As a budding mechanical engineer at the Technical University in Munich, he became fascinated by the 2nd law of thermodynamics and the maximum efficiency of a Carnot process and attempted to improve the existing thermal engines of the day on the basis of purely theoretical considerations. His first prototype engine was built in 1893, a year after he applied for his initial patent, but it wasn't until the third prototype was built in 1897 that theory was put into practice with the first 'Diesel' engine. 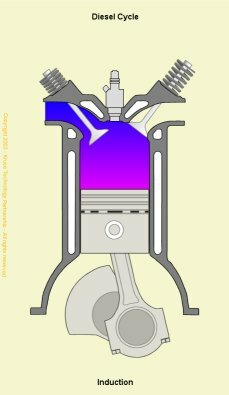 The Diesel cycle is the cycle used in the Diesel (compression-ignition) engine. In this cycle the heat is transferred to the working fluid at constant pressure. The process corresponds to the injection and burning of the fuel in the actual engine. 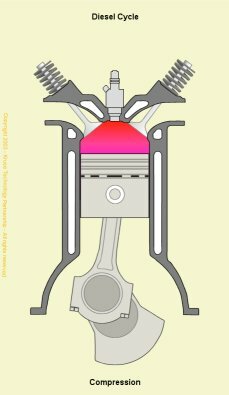 The cycle in an internal combustion engine consists of induction, compression, power and exhaust strokes. 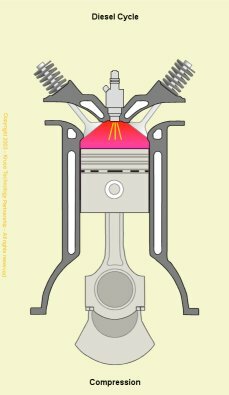 Compression ignition takes place when the fuel from the high pressure fuel injector spontaneously ignites in the cylinder. 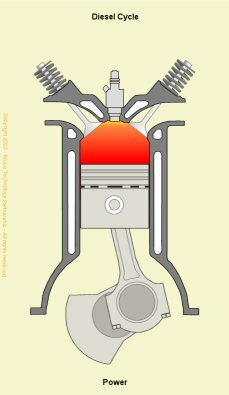 In the theoretical cycle, fuel is injected at TDC, but as there is a finite time for the fuel to ignite (ignition lag) in practical engines, fuel is injected into the cylinder before the piston reaches TDC to ensure that maximum power can be achieved. This is synonymous with automatic spark ignition advance used in Otto cycle engines. 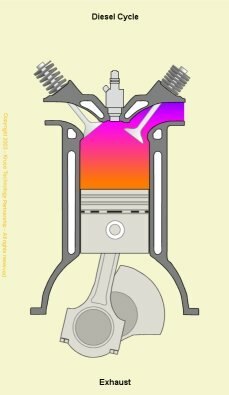 The power stroke begins as the injected fuel spontaneously ignites with the air in the cylinder. 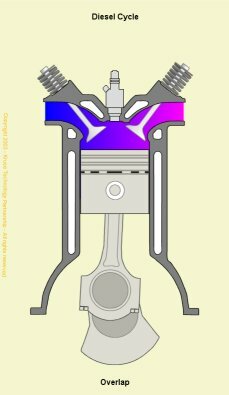 As the rapidly burning mixture attempts to expand within the cylinder walls, it generates a high pressure which forces the piston down the cylinder bore. The linear motion of the piston is converted into rotary motion through the crankshaft. The rotational energy is imparted as momentum to the flywheel which not only provides power for the end use, but also overcomes the work of compression and mechanical losses incurred in the cycle (valve opening and closing, alternator, fuel injector pump, water pump, etc. ).